I Can Pop More Than Backrow Now! To start off we have the big man himself, Endymion. Retaining his attribute, type, and level, Endymion, the Founding Sorcerer Supreme has access to tons of synergy with Pendulum support, Allure of Darkness, R7nk plays, and more. Endymion, the Founding Sorcerer Supreme is a scale 8 monster that packs a potential non-targeting board wipe and can set up for an OTK. Because his summon and destruction is all one spell effect, it is impossible to prevent it with cards like Infinite Impermanence or Effect Veiler. Also, the destruction he brings upon is mandatory, so you must attempt to destroy at least one card when summoning him from the Pendulum Zone turn 1. Luckily, Magical Citadel of Endymion exists, protecting itself from destruction at the cost of 1 Spell Counter. However, the destruction he packs is only his Pendulum Scale effect. As a monster, he can negate and destroy any Spell/Trap card or effect by returning a card with a Spell Counter to hand, and also transfers the Spell Counters to himself. 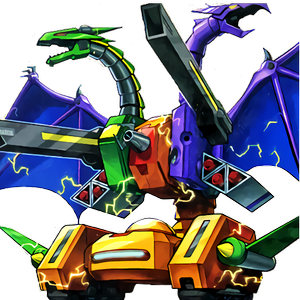 Also while he has a Spell Counter, he inherits the Majespecters’ immunity to targeting and effect destruction. If anyone runs over his 2800 ATK while he has a counter, he can add any Normal Spell from the deck. The combination of both his monster and spell effects make him one formidable card. Covering Endymion is quite the handful, but he also has friends! 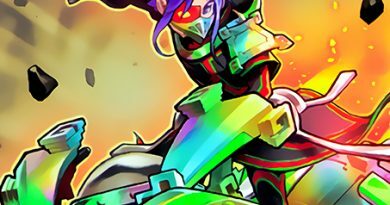 Breaker the Magical Warrior receives an evolution as Daybreaker the Splendid Magical Knight. Although not as strong as Endymion, Daybreaker destroys any card for the price of 2 Spell Counters. And just like the classic, he starts with a Spell Counter upon summon to get you a head start. Requiring any 2 Spellcasters for his Link Summon, Daybreaker is pretty generic and provides fantastic Link arrows for a Pendulum Summon. However, his abilities do not contribute much to a 1st turn setup, and in most cases Heavymetalfoes Electrumite will be preferred going 1st. However, his effect is decent for breaking and baiting boards, even if it has the downside of targeting and destroying. Like Endymion, Empress of Endymion removes Spell Counters to Summon herself from the Pendulum Zone. When Special Summoned this way, she acts as a Goblindbergh for any monster that can hold Spell Counters. This is particularly useful for board presence and acts as a starter for Electrumite plays. Empress also bounces an opponent’s card and 1 of yours with a counter when Special Summoned, which synergizes with her Scale effect. However, she (and the other Endymion subordinates) can only be Special Summoned once per turn. As a level 7, she offers R7nk plays alongside Endymion. However, she is nowhere near the power level of Endymion, but can offer disruption or removal depending on the timing. At 1850 ATK, she is searchable by Fairy Tail – Luna, but that isn’t very optimal. People will most likely play her at 1 or 2. Next, Servant of Endymion is the cement that holds the bricks together. A level 3 Wind Spellcaster, Servant removes counters to summon herself and any monster that can have Spell Counters with 1000+ ATK from deck. This turbos Endymion and Empress, but can also summon powerful monsters like Mythical Beast Jackal King and Master Cerberus. The 1000+ ATK may seem like a useless restriction, but it does prevent abuse with cards like Royal Magical Library. Also, Servant and the upcoming card Magister can return themselves to the Pendulum Zones if they would be destroyed on field. This allows for almost infinite recursion and very strong scales. Acting as an Emergency Teleport for the deck, she will definitely be used to start plays for Heavymetalfoes Electrumite. Her effects lacks a Once Per Turn clause, but gets balanced by being restricted to a Once Per Turn Special Summon. She also has monster effect to attack directly, which may be useful when time is almost up in the round. 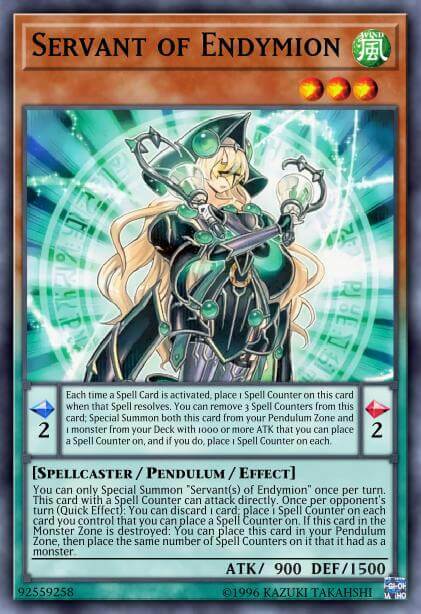 Finally, her field effect to discard to place counters seems lackluster, since Pendulums usually need all their cards in the hand. 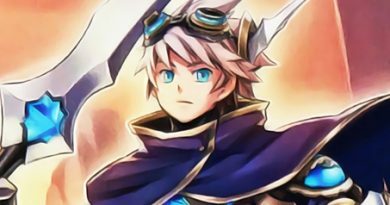 Servant’s boyfriend, Magister of Endymion, is exactly like Servant, but summons from the Extra Deck and has no ATK restriction. This effect is very synergistic with Mythical Beasts and conveniently frees the Pendulum Zone for Mythical Beasts’ Pendulum effects. Of course, he can summon any of the Endymion monsters too. The effect may seem like an extender because it summons from the Extra Deck, but with cards like Mythical Beast Master Cerberus it can sometimes start plays instead. 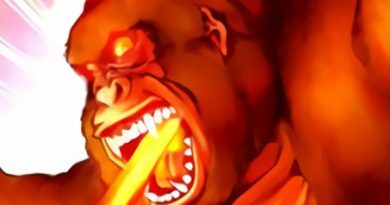 During the opponent’s turn, Magister removes counters to summon any monster that can hold counters from deck. This effect is perfect to summon Endymion and Mythical Beast Jackal King, putting even more field pressure and negates onto the board. Although powerful, Servant and Magister of Endymion suffer from the lack of Dark synergy. This deters the use of Dark support like Allure of Darkness and the effects of cards like Black Fang and Purple Poison Magician. 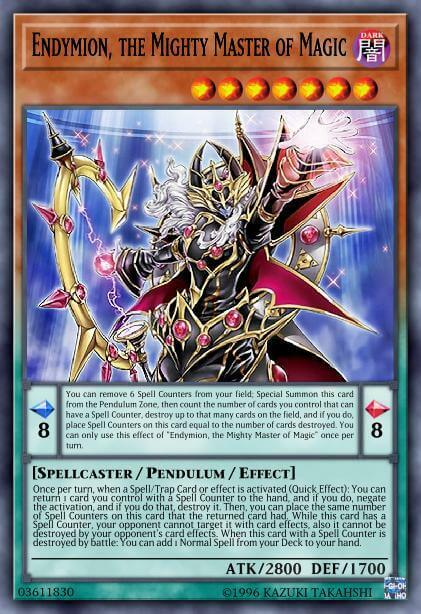 Also, Level 3 is awkward to pendulum summon with Spell Counter scales like Magical Abductor. Furthermore, the Rank 3 department currently only offers Number 75: Bamboozling Gossip Shadow for a turn 1 disruption. Endymion certainly is a strong monster and spell with fantastic support built around him. Endymion’s synergy with other Pendulum support is always appreciated, but some of the restrictions somewhat limit what the archetype has to offer. Also, it seems like a lot of the Endymion cards are designed to go 2nd, which typically isn’t preferred with any Pendulum deck. Overall, the archetype carries immense potential and could be broken in the right hands.